The Palm Desert treat has been bulbing up seasonal evenings for over a quarter century. 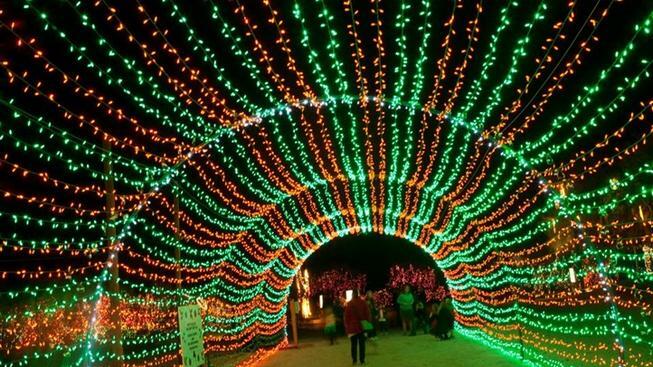 The desert sky is famously dark, while the walkways of The Living Desert will glow with a million or so bulbs, starting on Nov. 23, 2018. A MILLION-PLUS BULBS... being to glimmer, as if by magic, and a desert destination is transformed into something rather twinkly. No wave of the wand is behind this, but a lot of hard work and long hours on behalf of staffers at The Living Desert in Palm Desert. For this is the place where WildLights blooms each November-into-December, each year, and has bloomed for over a quarter century. The eveningtime illumination, which indeed boasts bunches upon bunches of magnificent bulbage, is a treat for those looking for a way to stroll outside, in a desert setting, near snoozy animals, when evening settles in, with lots of lights to lead the way. AND THE LIGHTS DO, with the "... popular tunnel of lights flashing to holiday music" serving as one must-see, but there are others. Admiring "... a herd of life-size, luminescent animal lanterns"? That can happen. Spying G-scale moden trains done up for the festive season? You bet. There are keeper talks, warm food for purchase, and beverages, too, all to add cheer and charm to this annual desert adventure of the most incandescent sort. WILDLIGHTS... lends dazzle over several select nights, beginning Nov. 23, 2018.